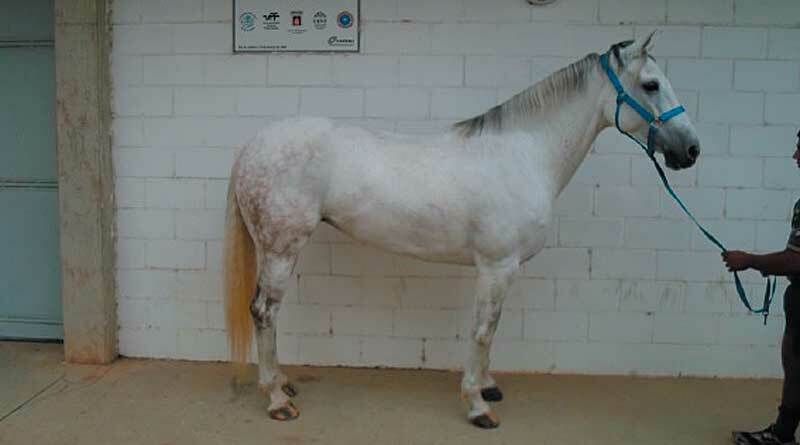 One of the Brazilian Sport Horses used in the study,in the stance used for their evaluation. Photo: Ferreira Padilha et al. The slightly “downhill” conformation of Brazilian Sport Horses in eventing training has been noted by researchers, a finding that suggests it may be a desirable trait for the relatively new breed. The fact that the breed tended to be slightly higher at the croup than at the withers indicated that, in the exercise of their skills over generations, the best animals had this conformation, the researchers said, even though, according to the literature, it was considered undesirable. Ana Maria Reis Ferreira and her colleagues, writing in the journal Revista Brasileira de Zootecnia, noted that a 1988 study had suggested it was, in fact, a desired characteristic in Brazilian Sport Horses, corroborating the findings of this latest study. Such a trait was also found in studies of several other breeds, they noted, including Campeiro horses, Thoroughbreds (in a 2014 study), and Quarter horses (in a 2015 study). The Brazilian Sport Horse breed began to appear in 1977, influenced by the English Thoroughbred, Hanoverian, Westphalian, Holsteiner, and Trakehner breeds. These contributed to its great genetic variability, with an inbreeding coefficient close to zero. The authors set out in their research to gather an extensive series of measurements of Brazilian Sport Horses used for eventing in order to paint a picture of their conformation. Seventeen Brazilian Sport Horses were used for the research. Thirteen animal-performance indices were calculated from the results in order to have a better understanding of the conformation of the animals and their proportions. These included the relationship between the withers and croup heights, chest index, dactyl-thoracic index, estimated weight, body index, thoracic index, and conformation index. The horses were found to be within the expected conformation for an athletic horse, but the animal-performance indices differed among them because they are heterogeneous horses resulting from crossing among various different breeds. The authors extensively discussed the raft of measurements taken and their comparison. The average height at the withers of the 17 horses was 1.62 metres, while the croup height was found to average 1.63m. The study team comprised Ana Maria Reis Ferreira, Felipe Gomes Ferreira Padilha, Agnaldo Machado de Andrade, Ana Beatriz Monteiro Fonseca, Fernanda Nascimento de Godoi, and Fernando Queiroz de Almeida, from a range of Brazilian tertiary institutions..
Fernanda Nascimento de Godoi, Fernando Queiroz de Almeida, Ana Maria Reis Ferreira.